The 2015 CFDA/Vogue Fashion Fund winners! On Monday night the fashion glitterati streamed into Spring Studios for a dinner to announce the winners of the annual CFDA/Vogue Fashion Fund Prize. After four months of multiple design challenges, a full-on runway show presided over by Kim and Kanye at the Chateau Marmont, and countless meetings with the likes of Anna Wintour and Diane von Furstenberg, the ten contestants were primed and ready for the results. After a dinner of chicken pot pie (a CFDA/Vogue Fashion Fund tradition) and a surprise performance by Andra Day, it was revealed that for the first time the competition had a three-way tie. 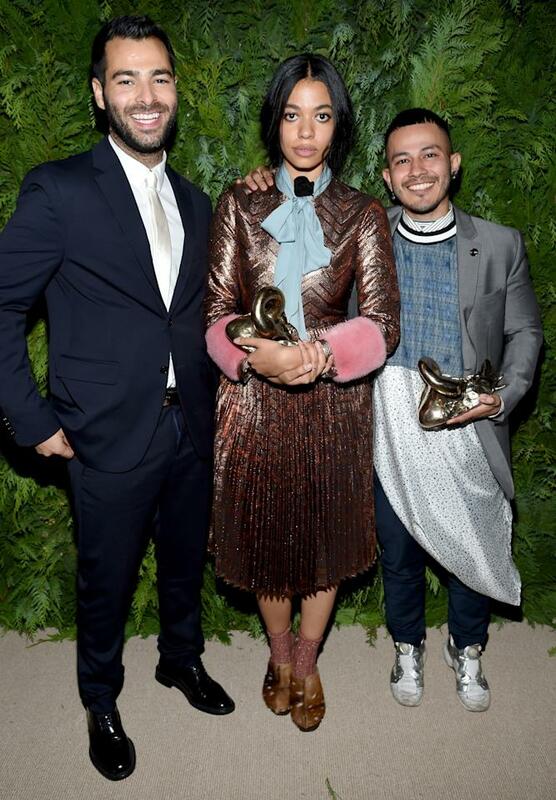 Womenswear designer Jonathan Simkhai, Gypsy Sport’s Rio Uribe, and Brother Vellies’ sustainable shoe designer, Aurora James, all took home the grand prize of $300,000 plus a year of mentorship. Earlier this year, Uribe predicted his win to Yahoo Style. “No one is left out of the Gypsy Sport brand. It includes everyone,” he said. “It’s the people’s brand and I think that people can recognize that. I have nothing against whoever else wins, but if Gypsy Sport wins, I think it’s just going to be the beginning of more of a connection with the consumer than a lot of other brands out there.” Kudos!